If you are spending a wonderful time in Branson and craving for a delicious pizza, visit Papa Grand’s Pizza at the Grand Country Buffet as the restaurant offers a variety of pizza that will surely satisfy your taste buds. This restaurant in Branson can make your salad exactly as you want it. The restaurant has several hot, fresh pizza options to choose from, and a salad bar with fresh lettuce and a variety of crisp, fresh vegetables and other toppings. Papa Grand’s Pizza is conveniently located on Highway 76 in the Grand Country resort where you can stay, play, and eat to your heart’s content. 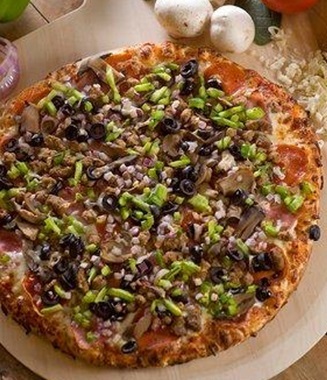 Papa Grand’s Pizza is a unique restaurant in Branson that includes a full Salad Bar and delicious, hot Pizza Bar. This pizza restaurant offers an inviting family-style service which allows you to choose exactly what you want of the portions served to you. The quality and friendly service also allows you to spend as much time with your meal as you like. At Papa Grand’s Pizza, you can dine at your leisure. Offering 12 varieties of fresh pizzas and 3 dessert pizzas, even the largest of appetites will surely be fully satisfied. They also offer take-out pizzas to meet all your needs. At Papa Grand’s Pizza, you can dine in and choose from a variety of pizzas and desserts, or order your own pie to take with you. In this pizza restaurant, you are sure to satisfy your appetite and fill your belly with delicious, hot pizza and tasty fresh salad. The Grand Country Resort where Papa Grand’s Pizza is beautifully nestled, offers an array of convenient and delicious on-site restaurants for you and your family. At the resort, you’ll start your day with Grand Country Buffet’s bountiful breakfast with great servings of fresh fruits, homemade breads, cereals, farm fresh eggs, yogurt, sausage, bacon, potatoes and more. Enjoy ultimate satisfaction with your appetites and diet needs from the light to the traditional breakfast from the cold and hot scatter bar buffets of Papa Grand’s Pizza. Be satisfied with luscious lunch served at Grand Country Buffet. Dining at Grand Country Buffet is a nice dining experience reminiscent of dinner at Grandma’s house that ends a perfect day in Branson. Let the slow-roasted, succulent roast and ham fill your plate from the vast varieties of five food bars with meat choices, salads, fruits, vegetables, fresh baked breads, bakery desserts, ice cream sundae bar and more. A perfect and remarkable day in Branson is sure to be enjoyed if you dine at the Grand Country Buffet as it offers more than 125 items to choose from. Papa Grand’s Pizza at the Grand Country Buffet offers a unique and affordable dining experience where you can have a satisfying meal on its full Salad Bar and hot Pizza Bar. Papa Grand’s Pizza at the Grand Country Buffet is a great pizza restaurant in Branson that offers 12 varieties of fresh pizza and 3 dessert pizzas.